Told by the activists and leaders who live and breathe this movement for justice, Whose Streets? (2017, 100 min) is an unflinching look at the Ferguson uprising. When unarmed teenager Michael Brown is killed by police and left lying in the street for hours, it marks a breaking point for the residents of St. Louis, Missouri. Grief, long-standing racial tensions and renewed anger bring residents together to hold vigil and protest this latest tragedy. Empowered parents, artists, and teachers from around the country come together as freedom fighters. As the national guard descends on Ferguson with military grade weaponry, these young community members become the torchbearers of a new resistance. Filmmakers Sabaah Folayan and Damon Davis know this story because they have lived the story. Whose Streets? is a powerful battle cry from a generation fighting, not for their civil rights, but for the right to live. Every day, Americans experience a mediascape that humanizes whiteness, delving into the emotional lives of privileged white protagonists while portraying people of color as two-dimensional and mostly negative stereotypes. Nowhere was this more apparent than in the case of Mike Brown who, despite being college-bound and well regarded by his community, was portrayed as a "thug" and a "criminal." As a result, Ferguson has experienced media colonization since August 9th; as all eyes turned to the protests, the Grand Jury, and the response to the non-indictment, people became desensitized to the scenes of chaos. The dehumanization of Mike Brown was perpetrated by his murderer, perpetuated by the media, and reinforced by violent police repression of his community. This was a modern day lynching. We are intimately aware of how we are portrayed in the media and how this portrayal encourages both conscious and unconscious racial bias. For this reason, it is essential that Black people be the ones to tell our own true stories. We are uniquely suited to make this film because we ourselves are organizers, activists and deeply connected to the events of August 9th and beyond. We are making this film, in part, as tribute to our people—our deeply complex, courageous, flawed, powerful, and ever hopeful people—who dare to dream of brighter days. This is more than a documentary...this is a story we personally lived. This is our story to tell. 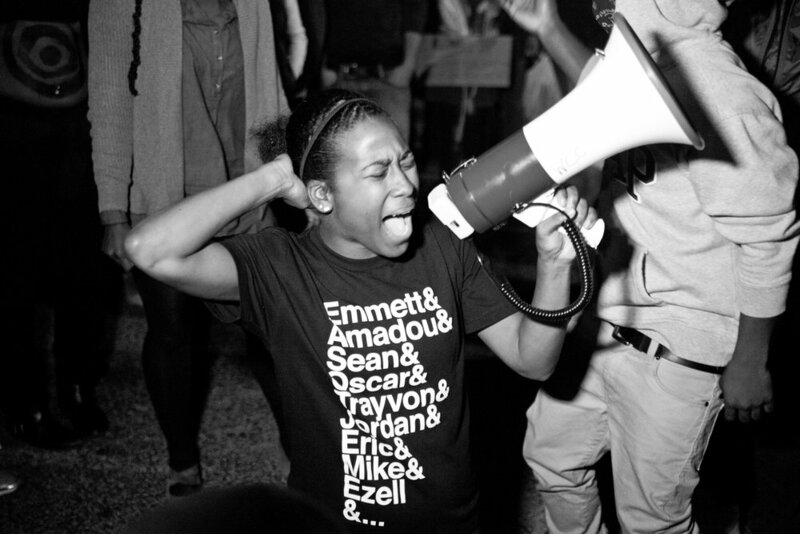 Activist Alexis Templeton in WHOSE STREETS?